With great sadness we were informed that Tomás Alarcón Eyzaguirre has left this world; he was descendent of the Qolllana Aymara in Perú and president of CAPAJ (Comisión Jurídica para el Autodesarrollo de los Pueblos Originarios Andinos). 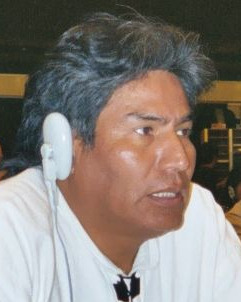 We have known Tomás since he came to the United Nations; he has committed his life as a lawyer defending the water rights in the Andean region of Tacna in the South of Perú as well as defending the rights of Indigenous Peoples in the different bodies of the United Nations. He tirelessly pursued his fight with enormous perseverance and strong passion. We have known and appreciated Tomás as a compañero and friend who highly contributed to the achievements of the Indigenous Peoples in the United Nations system for more than 20 years. We will miss his presence and voice. Our deepest condolencies as well as our support in solidarity go to his sons and his family. Tomás will be kept in our good memory and his spirit will continue to live together with us.